Too many strollers on the market? You need help? Great, because I have for you review of one of the best! Bugaboo brand is well-known for innovative and fashionable baby products. It adapts perfectly to challenges and changes of modern life. Their strollers are not only multifunctional and easy to use, but also very stylish and high-quality. A great example of this is the Bugaboo Cameleon 3, the third generation of this all-in-one stroller. It is a convertible type of strollers which can be used with a bassinet, infant car seat or normal toddler seat. The Cameleon is a real infant-to-toddler stroller. Bugaboo Cameleon is actually a frame with a toddler seat with an option of adding a bassinet or an infant car seat. The frame folds up really compact and fits easily into average car trunk. The frame and the bassinet are sold separately, however the great thing about Bugaboo is that we can create our own set and choose the elements and color of the stroller. If you are looking for a convertible, long-lasting, high-quality and luxury stroller, you’ve come to the right place! Adjustable handlebar makes chair good for every (small and tall) person! The handlebar is adjustible and telescoping extendable (from 39.8 to 44.2 inches). This is a great feature for parents of different height. If you are a tall person you just need to unlock the handlebar, pull it toward you until the height is comfortable for you, and then lock the handle bar again. It’s very simple but really useful. Besides, Cameleon has one more great feature – the handlebar is reversible, therefore we can change the position of small and big wheels, depending on the terrain we hit. Bugaboo Cameleon is equipped with a normal toddler seat. It has three reclining position so the baby can sit upright, relax or lie down and take a nap (25.4 degrees from the ground). The last two positions are great for younger children, the first one is more appropriate for older toddlers (1-2 years old). To recline the seat we have to push two buton at the same time. The seat can accommodate a child up to 37.5 pounds. The seat is also reversible, therefore the little passenger can ride facing forward or parents. This is very useful because a toddler sometimes is more interesting in surroundings and sometimes wants to see her/his mommy and daddy 🙂 The seat has also a foot rest. The fabric on the seat is very soft and can be clean pretty easily. The bassinet can hold an infant up to 19 pounds. It is equipped with deluxe Aerosleep mattress that makes napping more comfortable. Besides, the seat, as well as the bassinet is bigger in Cameleon than in other Bugaboo strollers. Therefore it can accommodate taller children and serve longer! The bassinet is also equipped with carry handle which is very comfortable when we want to transport the sleeping baby without taking him/her out. 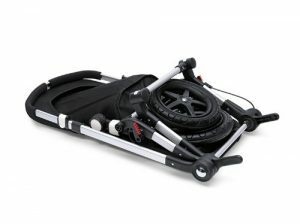 The Cameleon can be also used with an infant car seat, we just need an adapter for it. Many car seats fit into this stroller frame. The seat is equipped with five point harness and shoulder straps which can be adjust to baby’s height and grow with the baby. The newest model offers improved harness. Each of five starps can be adjust individually. It means we can loose the one strap that we need: to make more room for shoulders, belly, hips. It is not only useful for growing baby, but also very helpful during different seasons and weather conditions. When the baby is bigger or dressed in a fluffy winter jacket, we can extend the right belt. The harness has a buckle in the middle and it opens with just one click. 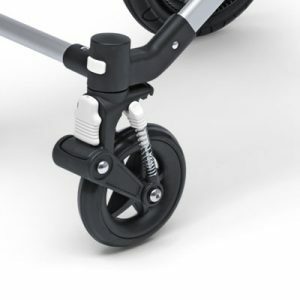 Bugaboo Cameleon 3 is also equipped with one hand-operated brake. The brake is placed on the right side of the handlebar. It is very easy to set and release. However, you have to remember to watch out for the hand lever when you release the brake, because it can slap you. Problem with ground? Convert stroller to two-wheel vehicle! Bugaboo Cameleon has a pair of small wheels and a pair of large wheels with durable foam-tilled tyres. This type of tyres provides comfortable ride for the baby and parents don’t have to worry about getting flat. The handlebar is reversible therefore there are two different wheels position. We can decide whether we want to have big wheels in front or in the back. 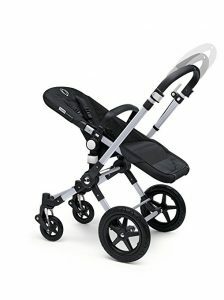 The bigger wheels are 12” and when we put them in front we can easily push the stroller through bumpy, uneven terrain. It’s very useful feature, because it makes this stroller all-terrain vehicle. Smaller, pivoting wheels in the front make stroller easier to navigate through narrow spaces. This stroller handles city streets and sidewalks, wooded trails and even sand or snow. It just glides effortlessly! Nevertheless, remember that it’s not a jogging stroller and you can’t run with it. 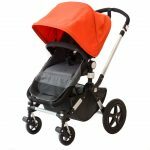 If you are looking for a jogger check out the best strollers in this type! 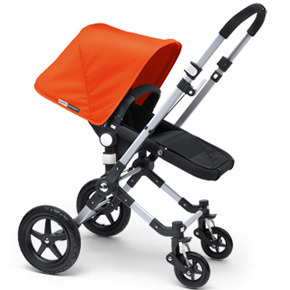 And finally, Bugaboo Cameleon 3 offers something that the other brands usually don’t have! It can be converted into two-wheel vehicle! This position is very helpful if we want to go through the sand or snow. You can use this basket even as a bag! This is one of the features that makes the Cameleon different from other Bugaboo strollers. 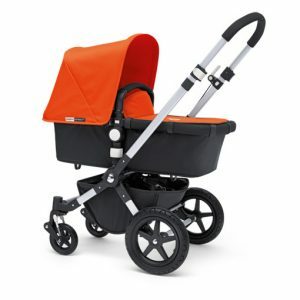 The basket underneath the seat is much bigger than in other strollers of this brand and previous versions of Cameleon. It is also more accessible from the back and front. It can accommodate storage up to 8.8 lbs. What fits into this basket? I didn’t have any problems with fitting bag with 10 diapers, pack of wet wipes, food and snacks into it. Although this basket is not the biggest one, it can be removed and used as a bag! It ha salso drawstring closure so you can be sure your gear won’t fall out. There is no other storage included in the set, there is no parent tray either, so there is no place for parent’s essentials like phone, keys or wallet. But this issue will be solved if we purchase Bugaboo Organizer, specially designed bag, one of the best additional accessories to buy separately. The Cameleon has typical Bugaboo “frog-like” suspension which can be adjusted as the baby is growing. Front wheels are equipped with 4-step suspension which can be adjusted to baby’s weight and type of the terrain. Thanks to this the stroller rolls smoothly on any type of terrain. The canopy in Bugaboo Cameleon is extendable and has UPF 50+ protection which is really awesome. I only wish the normal canopy which is included in the set have better ventilation. During cold months it’s okay, but in the summer if we pull the canopy all the way down the air circulation might be poor. This canopy also lacks peek-a-boo window which means we have to stop strolling (which might wake the baby up!) and look from the side or from the front to check on the little passenger, if the seat is facing world. However, Bugaboo offers also a different canopy with better ventilation. I tried this one and it is way better! It has mesh windows for air flow and a peek-a-boo window. It’s easy to use this stroller as car seat! Bugaboo Cameleon is compatible with many infant car seats. To attach a car seat to a stroller frame we need an adapter, which is sold separately. The adapter clicks into the stroller frame, and then the infant car seat clicks into the adapter. It is really stable once installed. Using the stroller with infant car seats is very useful, especially when you are running quick errands with your newborn baby and often get in-and ot of the car. Basinet is better for longer walks or when you are spending more time out, like when you go out to the mall. Only bassinet provides a fully flat position for a newborn therefore the baby can lay comfortably. We can change the seat we are using depending on our need, thereby the stroller offers great flexibility and multifunctionality. Bugaboo Cameleon 3 weighs 25.2 lbs, only the frame weighs 17.9 lbs, so it is not the lightest stroller but it is not bulky either. To fold the stroller we have to use both hands and it takes about five steps. Unfortunately, this stroller lacks automatic lock and self-standing mechanism. Before we fold it we have to remove the seat/bassinet. I get that it’s not possible to fold the stroller with bassinet but do we have to take off the normal seat? That’s really a bummer. ☹ However, the seat and bassinet come off very easily so it is not a deal breaker. Besides, unfolding the pushchair is much easier and can be done in two steps. All of the Cameleon features are super handy and we can use this stroller literally with one hand. This pushchair is very sturdy and agile at the same time. It is a convertible stroller but very nimble and slim. When we set the big wheels in front the stroller manages every bump with no problem and can handle rough terrain And when we set the smaller pivoting wheels in front the stroller will be easy to navigate and turn, even in tight space. And when we want to go over sand or snow we can turn the stroller to two-wheels position! Besides, the seat and bassinet are made of soft materials and riding in them is very comfy. Bugaboo takes care not only of parents’, but also baby’s comfort. We can choose many more elemens that we can purchase separately. Here is a list of the best additional accessories from Bugaboo. Footmuff – very useful thing during cold winter walks. It keeps baby warm during the whole stroll. It is designed in many color and the fabric wicks away moisture so the baby stays dry the whole time. Children tray with a cup holder – thanks to it your little adventurer will have easy access to snacks and drink. Seat liner – we can choose different materials for the seat liner. It provides soft and comfy ride for our little passenger. Rough terrain wheels – Bugaboo offers a set of wheels with rubber tyres, perfect for riding over tough terrain like beach or snow. Cup holder for parents – it is definitely a must-have, especially if we like long walks. Organizer – it gives additional space for baby’s gear like diapers, wipes, clothes or toys. We can also put there our essentials like wallet,keys and phone. Breezy sun canopy – this canopy has a great air flow thanks to many mesh windows and has also a peek-a-boo window so we can spy on out little rider the whole time. Transport bag – it is a bag where you can put folded stroller, great thing for parents who travel a lot (if you do travel a lot, check best travel system strollers in 2017). Mosquito net – that shield will protect your baby from insects. Tailored fabric set – we can choose the color of the canopy and bassinet apron. 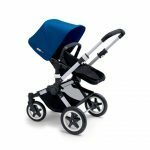 Bugaboo Cameleon 3 offers many color options. We can choose the color of the frame, seat base and canopy. The frame can be made in two different colors: silver or black. There is eight color options for canopy: red, orange, petrol blue, white, grey, black, ice blue and soft pink. The seat can be black or dark grey. 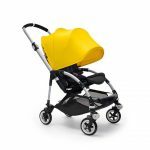 There are also five special editions that offers a silver frame and the whole stroller (seat, canopy and underseat basket) in one chosen color: lighter or darker grey, dark khaki, sand and navy blue. All of the color options and information about specification you can also find on the brand’s official website. The following table show the advatnages and disadvantages of Bugaboo Cameleon 3. I guess this huge amount of advantages compensates for these few small flaws. 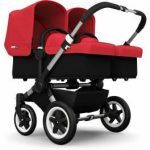 Below you can find a table with a comparison of four Bugaboo strollers: Bugaboo Cameleon 3, Bugaboo Bee 3, Bugaboo Buffalo and Bugaboo Donkey Stroller Review. They are all high-quality and fashionable pushchairs with many similarities, but also have some differences. Check out my comparison and choose the best Bugaboo for you and your baby! Bugaboo Cameleon 3 is a trendy and versatile baby stroller which takes care of the little passenger’s and parents’ comfort. 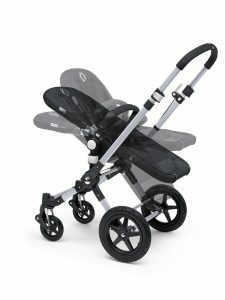 I like Bugaboo Cameleon 3 for its flexibility, which is actually a standard for this brand! :) We can switch from seat to infant car seat or bassinet, adjust the handlebar height and even convert from four-wheel stroller to two-wheel vehicle! In my opinion the flexibility that Bugaboo offers is very important to parents, because with babies everything changes very quickly. Having a multifunctional, compact stroller simply makes life easier. 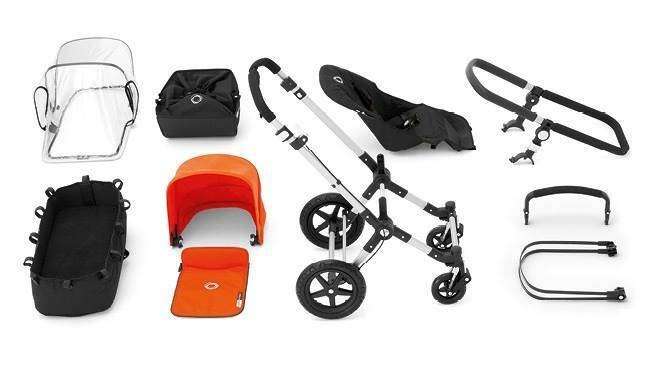 Bugaboo Cameleon adjust to family needs and grows with the baby.